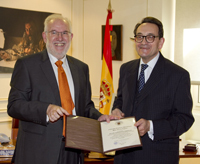 Felipe Fernández-Armesto, William P. Reynolds Professor of History at the University of Notre Dame, has been appointed the 2011 Cátedra Hispano-Británica Reina Victoria Eugenia at the Complutense University of Madrid. Named for Queen Victoria Eugenia, the consort of Spanish King Alfonso XIII, the honor is awarded each year to a distinguished British professor in a different discipline. This year, the academic chair is in communications studies. While Fernández-Armesto is best known as an historian, he also is an accomplished journalist whose work appears frequently in the national press in Spain and the U.K.
“I’m basing my [chair] lectures on the problem which I call ‘understanding misunderstanding,’” he says. “Why do we misunderstand each other so much? Why is it so hard to get people to grasp the message? Why in ordinary conversation do we understand each other so little? Why do international negotiations break down? Why, when people have heard the same ad or lecture or radio or television show, do they all give you different accounts of what it said? Fernández-Armesto, who teaches fall semesters at Notre Dame’s South Bend campus and spring semesters at the University’s London Centre, gave his first lecture in Madrid in January and will return to Spain to present additional talks during spring break and at the end of the semester. His research and teaching interests include Spanish history and the history of late medieval and early modern colonial societies, particularly cartography, maritime subjects, exploration and cultural exchanges. In recent years, he has made contributions to global history, understood as the study of genuinely global experiences, and to global environmental history. Among his current projects, Fernández-Armesto has accepted a grant from a Spanish foundation to write a history of the United States from a Hispanic perspective, and he is editing the 2010 Schouler Lectures, an endowed series of talks he presented at Johns Hopkins University on the subject of 18th century slave languages in the New World. “I’m also researching cultural organisms,” he says. “How do you find a common frame of reference for describing the history of all societies and cultural organisms? What can the study of other primate societies—and other cultures belonging to animals more remotely connected with us—tell us about our own history? Can we find a common frame of reference in which we could write about the history of all cultural organisms? Originally published by Kate Cohorst at al.nd.edu on March 10, 2011.